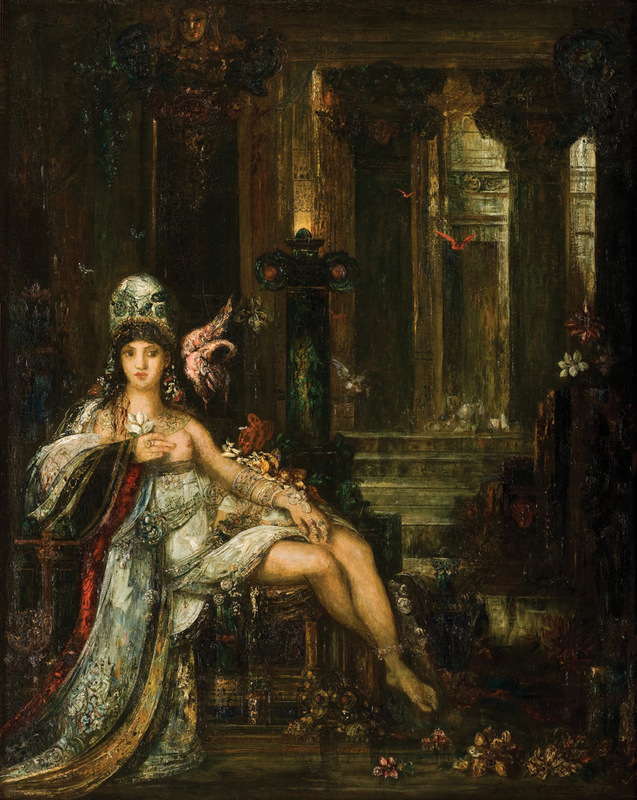 Gustave Moreau’s “Delilah” (1896), oil on canvas. Museo de Arte de Ponce. And Nancy Pelosi proved she was right. On yet another Farewell Friday — goodbye, Roger Stone — President Donald J. Trumpet announced that a deal had been made to end the 35-day government shutdown that held 800,000 federal workers and the rest of the nation hostage. Translation: Senate Majority Leader “Mitchie” McConnell told Hair Furor that he didn’t have the votes to keep the repudiated Repubs in line and so Donnie Two Scoops was forced to cave. As usual, he put the best spin on things, talking about “rank and file” Dems who are going to give him money for a wall — uh, sure, let’s go with that — and anyway, it doesn’t need to be an actual wall from “sea to shiny sea” but you know, a smart wall with some fencing and more border agents — in other words, what intelligent people have been saying for years. And so a little more than a month after this fiasco began, the government is about to reopen for three weeks as Dems no longer in disarray and repudiated Repubs debate border security, which puts us back where we were in December. All that waste — of time, money and manpower — just to find ourselves in “Groundhog Day,” except without Bill Murray and the humor and the moral about transcending yourself. And all because Coulter and Russ Limbaugh hurt Donnie’s widdle feelings. Coulter is a sort of blond Delilah, goading Trump on, calling him weak, which is one of the oldest tricks in the female playbook. Pelosi, too, used a traditional woman’s approach — grandmothering the toddler in chief by calling his bluff when he huffed and puffed and going all passive-aggressive on the State of the Union speech. It’s ironic that the most powerful woman in the world — make that the most powerful person in the world — should succeed by playing the woman’s card. But hey, women are new to the power game, so they have to use whatever’s at their disposal. Pelosi played a strong hand brilliantly. Some of the Trumpettes have tried to put a brave face on what happened — saying the president has bought more time to get the money for his wall, the pressure’s on the Dems, blah, blah, blah, blah, blah. But face it: A loss is a loss. One poster said there are no winners in war. Oh, yes, there are. If that weren’t true, we in America would all be speaking German right now. These people cannot accept that they were wrong and they lost. It’s the same kind of monstrous pride that brought us down in Vietnam and that will bring the Brits down in Brexit. But make no mistake about it: Donnie has lost, and something has changed. A wheel has turned. He’ll get his money, perhaps in exchange for a permanent path to citizenship for the Dreamers — ah, the irony, El Presidente, who thinks the “coyotes” who smuggle undocumented immigrants are actual coyotes, could’ve had $25 billion for border security in exchange for the DACA kids back in the Paleozoic Era when both houses of Congress were in Repub hands. Now he’ll be lucky if he gets a couple of billion but surely no wall. And he won’t try the shutdown stunt again because there is neither the stomach nor the Congressional votes for it.